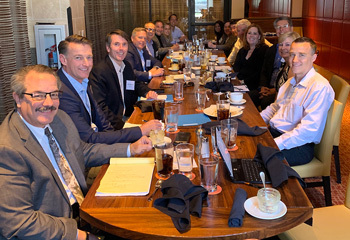 On Wednesday, I was fortunate to be included in a round table discussion with the senior leadership of Kaiser Permanente’s small group sales and account management team. To encourage discussion, Kaiser limited participation to a few key brokers. Kaiser has consistently offered the lowest rates in the California small group market by offering a comprehensive health care delivery system where the doctors, hospitals and insurance company act as one entity. One of the reasons that Kaiser is an industry leader is that they seek input from stake-holders and implement the best ideas. Kaiser is working diligently to improve their computer systems so that small group employers (1-100 employees) and brokers will be able to better manage their accounts online. The revised system will enable brokers and employers to add and terminate employees from coverage; view invoices; and manage other administrative tasks. Kaiser has invested a great deal of staff time and resources to improve their system. One result should be an easier-to-understand – and shorter – monthly invoice. While Kaiser is committed to keeping rates low, they do so with an extreme financial burden: payments they must make to their competitors. The payments are intended to more evenly spread the financial risk borne by one insurance company that may have enrolled higher-risk/sicker individuals. In theory, the insurance companies with healthier members pay insurance companies with sicker members. The problem is that the formula to calculate risk seems to favor high-cost insurance plans. Simply put, in California, the HMO plans pay the PPO plans. The risk adjustment transfer formula does not account for plans that have more advanced approaches to care management or more progressive value-based contracting methods that help drive premiums lower in a market. The transfer formula penalizes plans with lower premiums and rewards those with higher premiums in relation to the statewide average premium. Unfortunately, low cost insurers working to keep the marketplace affordable for individuals are being hit with the formula imbalance. Similarly, the inclusion of administrative costs (e.g., non-claims costs) into the calculation further exacerbates the issue for highly efficient plans with low administrative costs. (With Kaiser) There is no financial gain for driving up high volume and high intensity services in the emergency department or hospital, nor would there be gain to Kaiser Foundation Hospitals by having “insured” patients admitted to its facilities. The Permanente Medical Group’s (the doctors) share in the hospital budget variance through Kaiser Foundation Health Plan (the insurance company), so it is in their best interest to see that care is delivered in the most appropriate clinical setting. The fee for service medical care delivery model encourages more testing, treatment and medical services because each medical provider in the system is rewarded for doing MORE services – not for offering high quality care. Accordingly, the risk adjustment payments seem to reward high-cost, inefficient medical care and weigh heavily on Kaiser when they set their rates. Policy makers should re-evaluate these payments. The brokers and Kaiser reps agreed that many people have a skewed view of the services Kaiser offers. Kaiser’s integrated care includes doctors, hospitals and the insurance company. As such, when something goes wrong people don’t simply blame the doctor or the hospital. They blame Kaiser. No other insurance company has this burden. In fact, as the above referenced Brookings Institution article describes, the medical outcomes at Kaiser are significantly better and at a lower cost than other health care delivery systems. Hopefully, Kaiser will develop some marketing material that cites third party analysis of their system. Another idea mentioned at the meeting would be for Kaiser to create a medical plan that uses Kaiser doctors and facilities but also pays for services of out-of-network providers. Years ago, Kaiser offered a “Point of Service” (POS) plan which covered services out of the Kaiser system. Now, Kaiser only offers a very high-priced PPO plan which doesn’t offer access to Kaiser. The executives told us about the Added Choice Point-of-Service Plan that they are testing in Georgia. If successful, Kaiser may expand this plan design in other states and hopefully bring it to California. Kaiser is an extremely well-run organization that has done a lot of work to improve itself. In the course of our meeting I heard the executives describe Kaiser’s work in extremely precise and clear terms – evidence that they have given a great deal of thought to their processes. While this may seem obvious to many; I found it overwhelmingly insightful – and I’ve been in the business for 25 years. If you’re interested in offering Kaiser to your employees, please give us a call 800-746-0045.